You know my name... or at least you will soon. Mike Orlando gets his point across. "Doing this interview might take away the pain," says Mike Orlando. The Adrenaline Mob guitarist is sitting in a body art parlor in his hometown of Staten Island, New York, chuckling nervously as a tattoo technician adds swirling lines and vibrant color to his already ink-adorned right arm. "Hey, you can say one thing for me - I'm different." He's got us there. And if the stars keep aligning for Orlando as they recently have, he's about to get pretty famous. By all accounts, it's been a long time in coming. 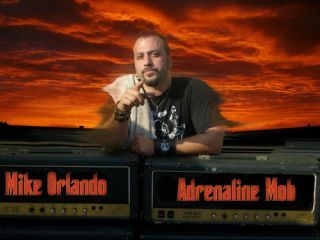 For years, Orlando flew under the mainstream radar, issuing well-received solo records as Sonic Stomp and winning admirers such as Joe Satriani, Steve Vai and George Lynch. He even nabbed Guitar Player magazine's Superstar Of The Year award in 2009. "There was a big to-do about that," he says. "It got my name out there; people started talking... It's funny: I've been this kind of best-kept secret. All along, though, I had faith that my abilities and dedication would pay off." That they have. On Adrenaline Mob's walloping debut, Omerta, due out on 13 March, Orlando, singer Russell Allen (from Symphony X) and superstar drummer Mike Portnoy power their way through 11 seismic cuts with the kind of unhinged intensity and earthy sophistication that recalls early Pantera. "It's a slamming album," Orlando enthuses. "I'll tell you, I feel so fortunate. We've got the songs, we've got a great live act - this is the band I've been waiting for." While Orlando tried to keep his mind off the intermittent buzzing of tattoo equipment, we talked to him about his guitar star-in-waiting status, how he approaches solos and what it's like to work with one of the world's most famous drummers. You're known but not well know. Of course, that could change soon. [laughs] "That would be nice! Yeah, I've been in the distant shadows somewhat. But I've been doing my thing, touring and all that. I've been to China, Japan, Germany - a lot of this has been with my instrumental band, Sonic Stomp. I guess people have been finding out about me gradually." As a player, who are your influences? How did you get started on the guitar? "All the great guitar players made their mark, though. Eddie and Randy were huge, but there were so many. I became this obsessed kid who just loved the guitar and all the greats." Mob rules. Adrenaline Mob are (from left) Mike Portnoy, Russell Allen, Orlando and John Moyer. What guitars do you play nowadays? Are you aligned with any one company? Do you think you might do a signature model? "We'd definitely like to do one. They sent me so many guitars to check out - a plethora of models. I've got the So-Cals, the San Dimases, the Soloists... I'm totally set. I'm going to take them on tour. But I wouldn't be with the company if I couldn't stand by their guitars. If they aren't great, I'm not playing them." Before Adrenaline Mob, you and Russell were already working together. "We started writing for what at first was going to be his next solo album. We were doing demos over a three-year period - he would go and tour, and I was involved in some other things, too - but eventually, we had some songs down. "It got a little complicated - again, because we were both so busy - but when we sat down and listened to what we had, we were blown away. Between Russell's voice and the sound of the music, we knew we had something. We went through a few different people while we were doing it. The idea of a new band was there." What made you send the files to Mike Portnoy? "It all happened fast. But, of course, once Mike Portnoy joins a band, everything changes musically. He can play a 4/4 beat, but it won't sound like anybody else. The energy level didn't go up one level, it went up 15 levels." How does working with Mike affect your own playing? "In about every way you could imagine. You start to see the music in a bigger way, because he makes it bigger. There's holes that you don't have to fill - but he's got your back. What he did to the song Hit The Wall alone, with that insane Mike Portnoy meets Keith Moon approach - it's incredible. So he really ups your game. You become a better guitar player because he's such an awesome drummer." When you recorded everything with Mike, did it go pretty quickly? "It did. We recorded at my studio, Sonic Stomp, in Staten Island, and yeah, it didn't take long. With Mike, it was about two weeks, off and on. He worked on various arrangements. Beyond being one of the greatest drummers ever, he knows music - music as a whole. He knows what songs should do, what they need to impact people. It was all pretty effortless, even though it was intense - intense and laid-back." Let's talk about some of your playing on the record. Undaunted features a knockout solo, but it's filled with drama and real themes. "Thanks. I didn't want to just go balls-out shredding all the time. What I like in any solo is a nice amalgam of moods and techniques. If you just play one thing throughout… well, that can work, but not all the time." You mentioned Hit The Wall, which has a bit of Soundgarden vibe. Your riffs, in particular, are vaguely Kim Thayil-esque. Do you plot your solos out, or do you like to wing them? "I wing 'em. The best approach is to capture what comes out of your heart at that moment. Lay it down on tape. Good, bad, pretty, whatever - you're going to hear it all." There's some old-school harmony guitar lines throughout Angel Sky. "I love guitar harmonies. You can't do them on just any song, but something like Angel Sky, when you're going for that kind of mood, they can really work. I'm with Eventide now, and they've hooked me up with their harmonizers, so now I can pull that sound off live." What kind of pedalboard do you have? There were some changes in the band during the past few months. Live, you went from a five-piece to a four-piece. "We did, but now everything's set. John Moyer from Disturbed joined us about a month ago, and we're psyched as hell. He came in, played with us, and we were won over in no time. He's part of the Mob. "I'm psyched to get out there and really tour behind this record. We're a live band, without a doubt. I mean, the record is great - we're all tremendously proud of it - but Adrenaline Mob is made for the stage. And we're going to be out there. You won't be able to miss us, I promise."